Osechi ryori, the traditional meal consumed by Japanese on New Year’s Day, is filled with foods that symbolize fertility (herring roe), good health (sardines), and longevity (shrimp). Japanese dancer and instructor Sachiyo Ito must have eaten a lot of shrimp, as she is entering her 31st year of teaching, choreographing, and performing traditional and contemporary Japanese and Okinawan dance in New York through her non-profit organization, Sachiyo Ito and Company. However, Ito attributes her longevity to the international flavor of the city and Western curiosity. Sachiyo Ito and Company’s performances introduce the uninitiated to elegant and beautiful kimono, the precise and exacting movements of Kabuki dance, and the contrasting liveliness of folk dances from Okinawa. When Sachiyo Ito and Company celebrated its 30th anniversary by holding a concert at Ailey Citigroup Theater in October of last year, the group performed to a packed house, which surprised Ito given the state of the economy and the number of non-profits competing for donations. A native of Tokyo, Ito started taking dance lessons at age six and later studied at the Fujima School of Japanese Dance. When she first taught dance lessons, many of her students were the wives of US military men stationed in Japan. Seeing an opportunity for teaching non-Japanese students – a kind of untapped market – Ito decided to take a chance in America. She left Japan, bringing with her centuries of traditional Japanese and Okinawan dance. She came to New York in 1972, earning her M.A. and Ph.D. in Dance from New York University. She then taught at NYU and the Juilliard School and participated in educational programs for institutions such as the Japan Foundation, Japan Society, and Asia Society. After giving a number of performances as a solo artist, Ito decided it was time to assemble a group of dancers. Thus, Sachiyo Ito and Company was born in 1981 “so that we can carry out the mission to promote friendship through dance, through the arts, through introducing Japanese culture,” says Ito. “I’m surprised [Brooklyn Botanic Garden] keeps asking us because there is so much interest in pop culture,” says Ito, referring to the Garden’s recent additions of a cosplay fashion show, manga and anime workshops, and performances by J-pop bands that appeal to a younger crowd. To broaden the scope of Sachiyo Ito and Company, Ito conducts a Salon Series, held three times a year at Tenri Cultural Institute. 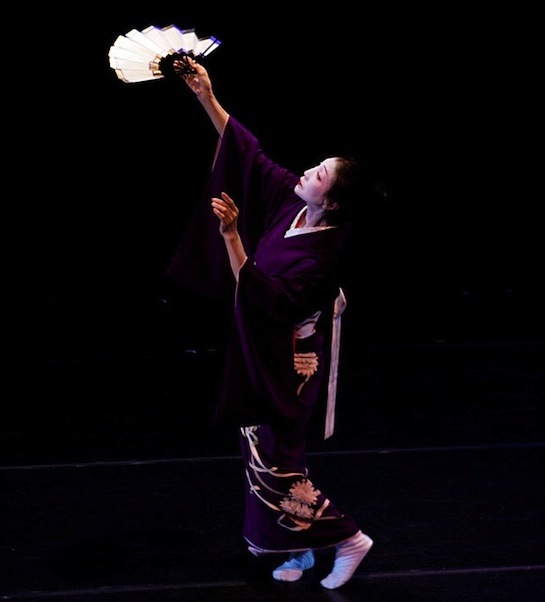 Through these educational lecture/demonstrations, Ito compares aspects of Japanese dance to the dances of other cultures and collaborates with dancers and musicians of all genres. In addition to performances and educational outreach, Ito continues to offer private dance lessons to twenty students, although not as many Americans as she had anticipated in the early 1970s. In essence Ito isn’t merely a dance teacher; by default she instructs her students in several aspects of Japanese language, history, and culture. The songs of the Okinawan court and folk dances she teaches contain Okinawan dialect, which is virtually unknown to Japanese people. The lyrics to Kabuki songs have lines from old waka (Japanese poetry) written in an ancient Japanese language that is no longer spoken. Ito turns into a history teacher when describing scenes from Kabuki and Okinawan dances that tell of court life and events that shaped Japan. Costumes play a major role in Japanese dance, and a lesson with Ito means a lesson in kimono culture: How to dress in the elaborate outfits, how to tie the obi (sash), how to use the fans and other props. One reason Sachiyo Ito and Company has succeeded for three decades is that Ito receives great satisfaction in bringing these intricate pieces of Japanese culture to New York and seeing positive reactions from those she teaches and entertains. As Ito walked onstage at Ailey Citigroup Theater in October, some of her former students were in the sold-out crowd, including one of her first: A military wife who flew from Nevada to celebrate Ito’s milestone and to remind her of her longevity. 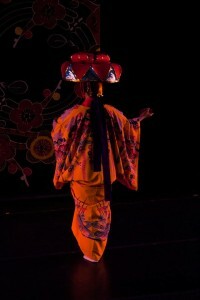 For more information about Sachiyo Ito and Company, visit dancejapan.com.